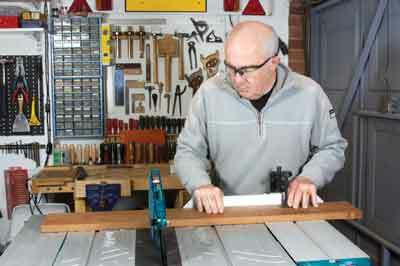 A saw table is the core around which many workshops are designed and is often the first purchase made when upgrading from hand tools and handheld power tools to workshop machinery. 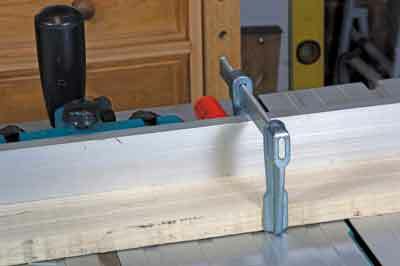 Circular saw tables vary from small bench-top DIY models to industrial panel saws designed to handle full sized sheets of board materials and as with all things they vary wildly in quality. 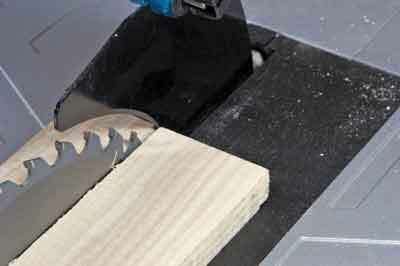 Broadly speaking we can divide them into three categories: bench top machines, portable and semi-portable site saws, and fixed cabinet saws. 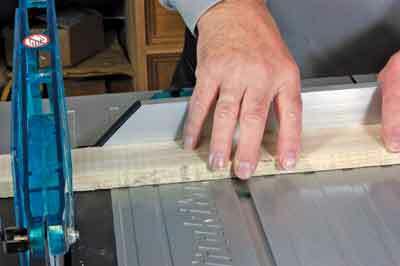 In this article I will be looking at the portable mid-range site tablesaws - often the first choice for the woodworker who seeks something more than a DIY tool but cannot justify the expense, or does not have the space for a fixed machine. 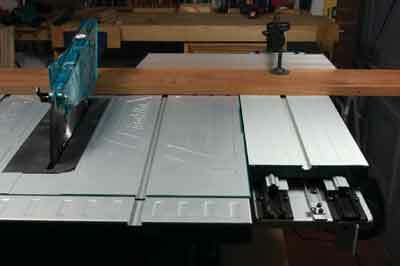 A tablesaw is a circular saw blade attached to a motor and mounted under a cast or pressed steel or aluminium table so that the blade protrudes through a slot in the table. 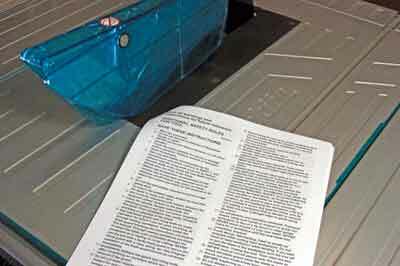 It is then supported by a casing of metal or plastic. 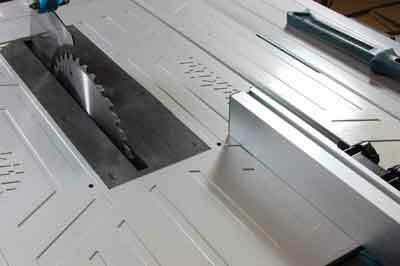 Depending on the sophistication of the machine there are facilities to raise and lower the blade, a means of tilting the blade to make mitre cuts, a rip fence and mitre guide and possibly a sliding table for cross cutting and extension tables to enable the user to manage larger workpieces. 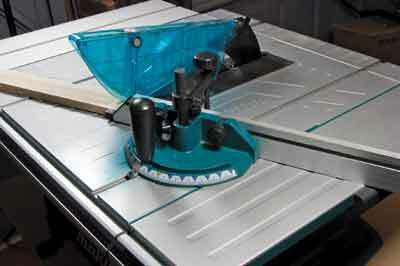 The best portable machines will be large enough with the extension table in use to rip full size boards. 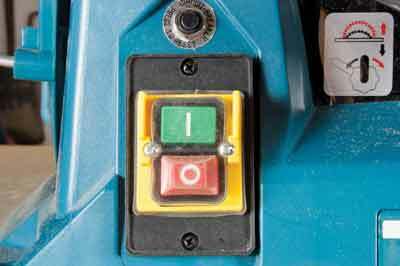 Safety devices will include a crown guard, riving knife, and anti-kickback device and an NVR switch to prevent accidental activation. One of the most important quality factors of a machine is the table, the best portable machines will have a cast aluminium table. 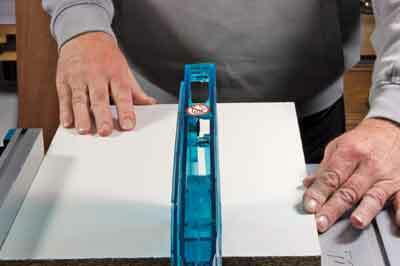 The table's flatness is vital to the cutting accuracy. 1. 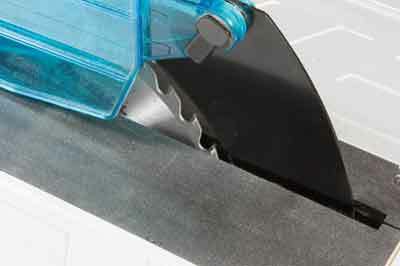 The blade provided with the machine will usually be a general purpose blade used for both ripping and cross cutting. 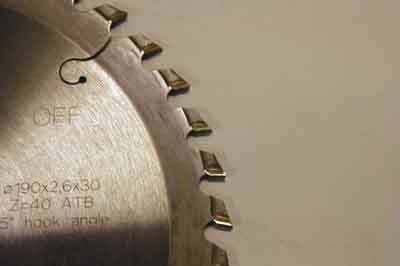 For many this will be the only type required, but for those with more specialised requirements, separate ripping and cross cutting blades are available and for those who frequently cut melamine faced or other laminated boards, blades are available with 'triple chip' tooth geometry for minimal chipping. 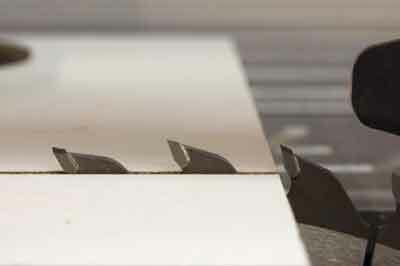 Better machines come with a high quality TCT tipped blade and for cheaper machines the most effective upgrade is the replacement of a cheap blade with one of better quality. 2. The height of the blade must be matched to the thickness of the wood being sawn and this is achieved by the rise and fall mechanism. 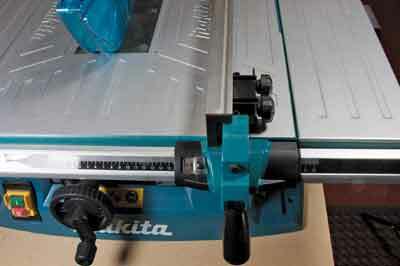 On this Makita machine the blade is raised and lowered by turning the front mounted hand wheel. 3. 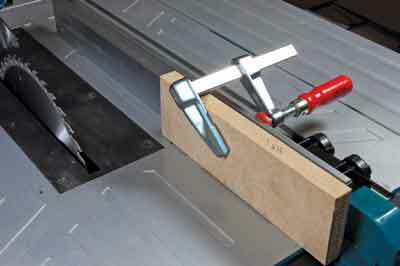 In order to facilitate mitre and compound mitre cuts the bevel angle is adjusted by means of a locking lever with preset positive stops at 45° and 90°. On better machines these presets will be adjustable for accuracy. 4. 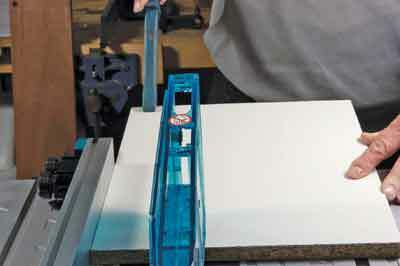 The mitre gauge is used for all cross cutting operations; it should be removed from the table when ripping. 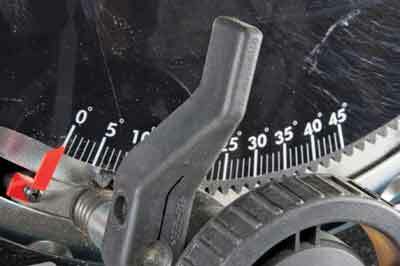 The gauge is adjustable for angle and it slides in the mitre slot in the table top or fixes into the mitre slot of the sliding table. 5. 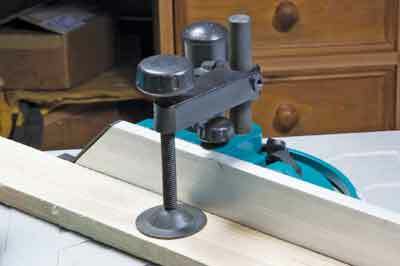 The workpiece should always be held firmly against, or preferably be clamped to the gauge. 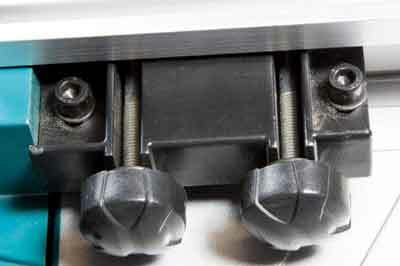 Some gauges have a clamping mechanism built in. 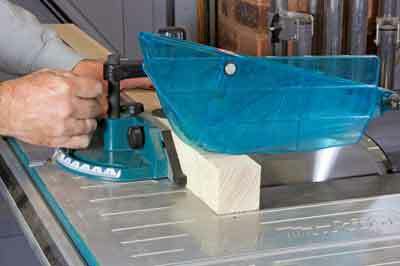 Tablesaws should never be used for freehand cutting. 6. 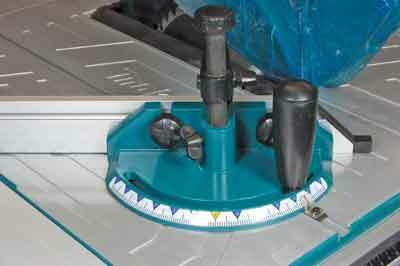 The gauge can be used to either side of the blade in one of the two slots provided to facilitate cutting at the required angle. 7. 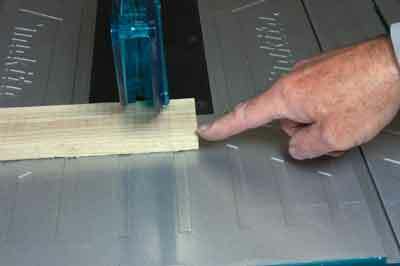 The rip fence is only used for ripping and should be removed from the table when crosscutting. 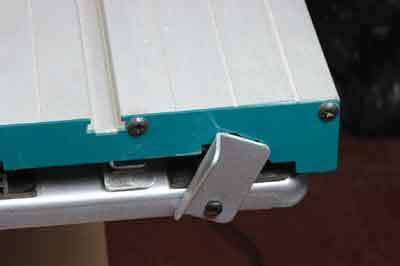 It is attached to a guide rail which may have a measuring scale built in and runs along the front of the table. 8. 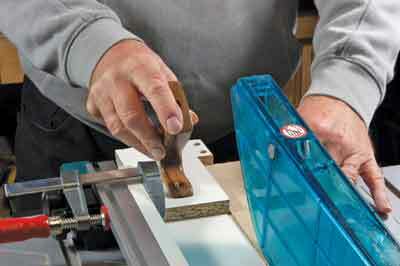 The fence should be adjustable to ensure that it is square to the table and blade. 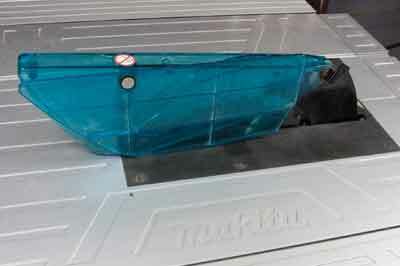 A badly adjusted fence can cause dangerous kickback. 9. 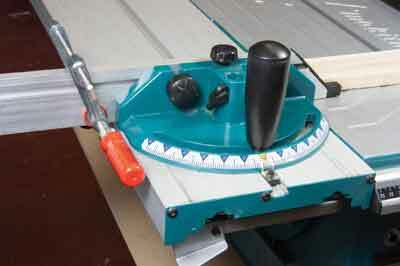 The sliding table with the mitre gauge attached enables the cross cutting of larger pieces. 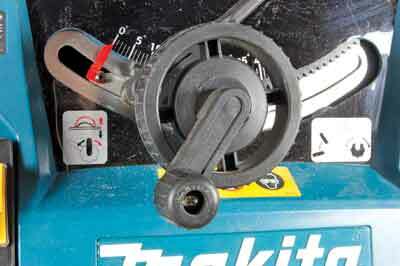 Again, the work should be clamped to the mitre gauge. 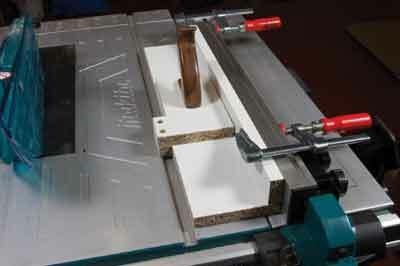 The sliding table, gauge and workpiece should be moved as a single unit when cutting.